One of the more unique and sticky-floored dive bar venues in London, Brixton’s Windmill is more used to seeing hip art/indie bands grace its stage these days, but every once in a while it welcomes some heaviness. Proving that wielding a caveman level of the stuff doesn’t mean you can’t have some soul too, OLD MAN LIZARD’s  part blues jam, part country-infused stoner onslaught feels steeped in the bucolic atmosphere of their Suffolk home town, and the warm stomp of the likes of Craniopagus Parasiticus separates them from many of the stoner-come-latelys. Peddling Theremins and vintage keyboards, Newcastle quintet KYLVER  sound far heavier than on record. They waste little time in harnessing their Baroness-scrapping-with-Zombi-in-a-science-lesson conjurings to bring to life a captivating post-everything beast. 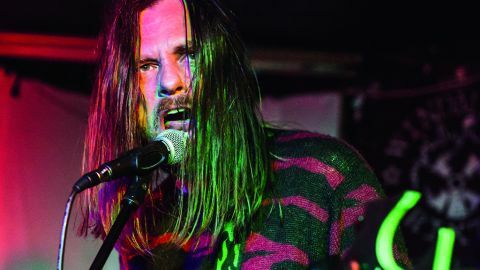 Like a drunk Mastodon or Black Tusk on ketamine at a football riot, there are few more exciting and completely unrestrained live bands in the UK than East Anglia’s MEADOWS . When you’re not quite sure where the mosh ends and the stage begins; when the lighting rig gets headbutted and the sound engineer looks momentarily terrified as half of the PA system very nearly topples on the front row, you know you’re doing something right. The early history of 11PARANOIAS  was one fraught with setbacks – from the departure of original drummer Mark Greening to abandoned recording sessions. But with the London/Newcastle trio having a recent run of dates behind them, the supreme potential you always felt lurked in a band featuring members of Bong, Ramesses and Capricorns emerges in horribly spectacular fashion. Creating a lysergic, psychedelic ritual of osmium weight, as the strobes go into overdrive during closer Lost To Smoke, bassist Adam Richardson lurches like the possessed, guitarist Mike Vest’s phase peddle opens up a portal to a dimension populated only by an evil Hawkwind and, as faces turn into Hieronymus Bosch paintings, your brain dribbles out of your ear and you know you’ve experienced something very special indeed.